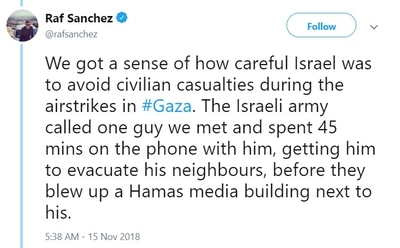 Updated Nov. 15: Telegraph journalist Raf Sanchez toured Gaza Thursday, describing a witnesses's account of the bombing. Al-Aqsa is Hamas' main media outlet which – like other Palestinian institutions – offers programs specifically geared to recruiting children to embrace terrorism and become suicide bombers to attack innocent Israeli civilians. Israel similarly targeted Hizballah's Al-Manar TV station during the 2006 war in Lebanon. "Israeli planes fired three missile alerts, before F16 planes targeted with at least three missiles the al-Quds TV headquarters, destroying it completely... No injuries were reported," reported WAFA, the official Palestinian Authority news agency, on Monday, according to Palestinian Media Watch.